Christmas Ornaments Made in USA - 1998 Supreme Court Ceiling Ornament - A Christmas Ornament Co. The A Christmas Ornament Collection presents 1998 Supreme Court Ceiling Ornament. The third in our series and an important collectors' edition! 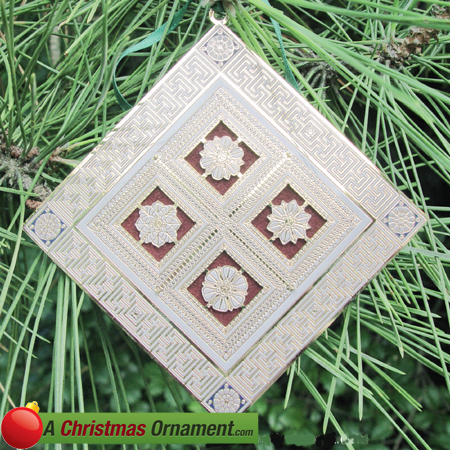 Our limited edition ornament captures every detail in one of the coffered ceiling panels located in the Courtroom. Finished in 24kt. gold, this three-dimensional ornament features four central rosettes. Mounted behind the rosettes is an actual piece of the red velvet drapery that hung in the Courtroom between 1935 and 1992.